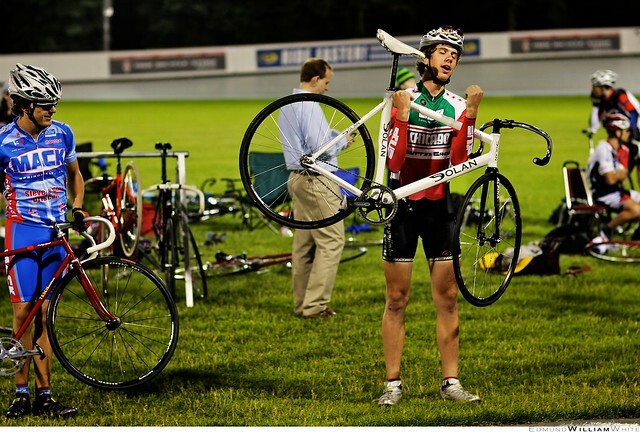 So our rising star, Mr. Brian Ellison, had a real bad accident at the 2011 Mayor's Cup race at Kenosha Velodrome. It was a nasty multiple-person accident involving a few ambulance rides and a few other riders getting medical attention. Thankfully mostly everyone was fine and walking afterward despite signs of the worst. Unfortunately, Brian didn't share that good fortune and was life-flight'd from a Kenosha hospital to Advocate Medical Center in Libertyville. Brian was diagnosed with a small skull fracture and internal bleeding around the break as well as a more or less floating collarbone with some serious abrasions across his body to boot. It was a long night full of plenty of anxiety for friends, teammates, organizers, competitors and especially family members. Many a thanks should be passed along to Josh, Molly and Joseph for literally chasing ambulances and helicopters all night in order to be liaisons to Brian and his fam. The news evolved from awful to stable over the course of a long 16 hours. He did have energy for visitors the next night and was well aware and willing to admit, "at least I got a cute nurse." His pain wasn't giving much, however, and his spirits dwindled when the migraines started trumping the meds within a few short moments of dosage. It was good to see he was 'there' but it wasn't for lack of a massive effort over the course of 20 minutes. As of Friday, the spirits have returned for longer spurts and the attitude is as pleasant as ever. Two key ingredients he'll need in the long path to recovery he has ahead of him. Discussions have also gone from what happened to what to do next. A tough transition to make laid up in a hospital bed but certainly another step in the right direction if you ask me. It's amazing how proud someone can make you from a hospital bed. We're all excited for the next milestone which will probably be the time he can stand without any dizziness and walk without assistance. That sounds a bit gnarlier than it is. As far as he's concerned "if" was never even in the picture and his optimism is contagious. Those of you that have had a chance to see him race or the pleasure of racing him in these last 12 months are well aware of the fire inside Brian. He can and will be needing it more than ever as he'll surely need to be patient and focused through this grueling spell of mundane exercises to get back to even touching a bicycle. Despite all the gems said outta that boys mouth in the past 3 days, "All in due time" is by far my favorite.